W​​ithin sight of the convention center in Marrakech, Morocco, where negotiators from around the globe are currently gathered for the latest U.N. Climate Change Conference of the Parties (UNFCCC COP 22), are the stark peaks of the High Atlas Mountains, where a rising number of droughts and floods are among threats facing the native vegetation that supports the livelihoods and well-being of Amazigh (Berber) indigenous communities. The mountains, which fall within the Mediterranean Basin biodiversity hotspot, are teeming with thousands of plant species, hundreds of which are endemic, or found nowhere else on Earth. The remote and largely self-sustaining communities in the region depend on these plants, both to sell and for sustenance and medicinal use to fight ailments such as stomachaches, joint pain and flu. But overharvesting and livestock overgrazing—along with climate change-exacerbated drought and floods —have had a serious negative impact on this fragile ecosystem. And though locals may know that certain plant populations are threatened, their need to support their families doesn’t give them much choice but to harvest. Recognizing this challenge, CEPF grantee Global Diversity Foundation chose two communities—Imegdale and Ait M'hamed—for a pilot project. The organization’s aim: to improve local livelihoods while simultaneously reducing the pressure on medicinal and endemic plant species. First, the organization produced an initial study of the medicinal and endemic species to use as a baseline for evaluating the impact of the project’s other activities. The findings indicate that around 80 percent of endemic species found around Imegdale are threatened with extinction. Aboufirass stressed the importance of involving the community early on. “Usually in those regions, the farmers are going to be very suspicious. ‘Who are these people? Who is coming to our land?’ If you get them to participate in the process and take the time to explain what you are there to do, you build a relationship of trust and then you have their support,” he said. Through this project, Global Diversity Foundation created community nurseries to house endemic species (including the threatened Atlas daisy) alongside income-generating species (such as walnut and almond trees) and domesticated medicinal and aromatic species like thyme, lavender and pennyroyal mint, which also provide important cultural and economic value. Community members can now collect plants from the nursery and harvest them for their own needs. By building new water basins, repairing traditional water canals called targa and setting up drip irrigation systems for select agricultural fields and orchards, the project both enabled the irrigation of more land and extended the irrigation season by two to three weeks. An additional benefit: A new pipeline that brings in spring water for irrigating the nurseries has improved the drinking water for about 50 families. This shift to more efficient use of water for domestic and agricultural needs leaves sufficient water in the ground to nurture the revival of healthy vegetation in the area. 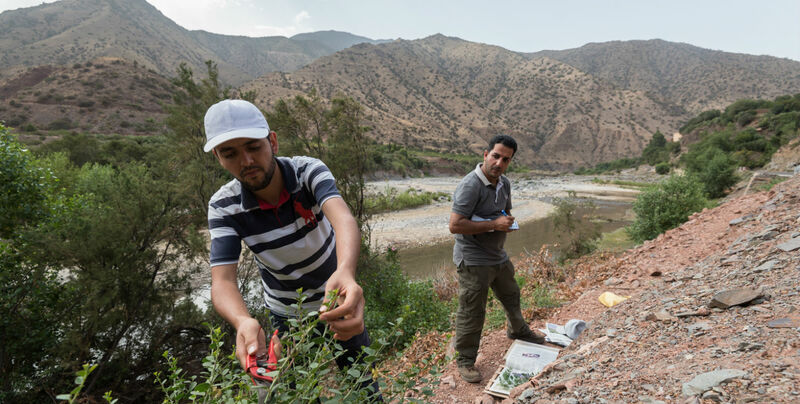 As climate change is predicted to further reduce water availability in the High Atlas, maximizing water efficiency will be essential if families are to continue to make a living in the mountains. Another challenge facing these communities is the low prices they too often receive for their crops. To change this, the communities organized cooperatives that allow the villagers to combine their efforts, improve their products and fetch higher prices through methods like growing higher-quality plants, packaging products onsite, obtaining “organic” or “sustainably harvested” certification and selling directly to wholesalers. “The population realized that if they get together and aggregate their activities, they can build momentum and do things that they could not do individually, like marketing together and packaging together,” Aboufirass said. Sarroukh stressed the importance of listening to the women in the communities when planning a project’s activities. “They can come up with ideas that are often better than what we can come up with as consultants because they know what they are talking about; they live it,” she said. For example, the Asska women’s cooperative in Ait M’hamed is making and selling handicrafts; another co-op in nearby Tagadirt N'bour is preparing and selling slilou, a sweet dessert flour made from many locally harvested ingredients, including barley and medicinal plants. The CEPF-funded project closes at the end of 2016, but Aboufirass and Sarroukh hope to obtain additional funding to continue their work in Imegdale and Ait M'hamed, focusing on improving drinking water and sanitation.